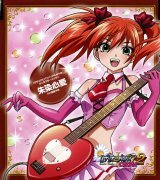 This CD contains character image songs to the TV anime Rosario to Vampire CAPU2. Songs by Saitou Chiwa (斎藤千和). "Shiroi Honoo" is a cover of Saitou Yuki's song.